With rumors that the Edmonton Oilers are looking to add a quality top-six forward at the trade deadline, there is one question that keeps coming up, which is where is the money going to come from to pay that winger. The team only has $2.2MM in available cap space, which won’t be enough to acquire the type of forward they want to add. Even if a team retains some salary, the Oilers are going to be forced to move a significant salary. However, the Edmonton Journal’s Kurt Leavins suggests that the team should look into trading goaltender Cam Talbot, whose $4.17MM salary could open up the money to acquire a top-six forward. With both of Edmonton’s goaltenders expected to hit unrestricted free agency next summer, it’s not likely the team will keep both and considering that Mikko Koskinen has a no-movement clause, Talbot would make the most sense to move to a contender who needs goaltending help. Unfortunately, Talbot’s numbers aren’t that impressive this year as he has a 3.17 GAA and a .896 save percentage – not likely to bring a significant return back. The Athletic’s Lisa Dillman and Josh Cooper (subscription required) debate the merits of whether the Los Angeles Kings should trade long-time goaltender Jonathan Quick at the trade deadline. With the impressive play of both Jack Campbell and Calvin Petersen, the team does have the luxury of moving Quick who could bring the team a significant return. The fact that he lacks a no-trade clause also is beneficial. However, each scribe also points out that with so many struggling teams this season, this might not be the best time to move a goaltender as there are so many of them out there. Plus, Quick’s leadership and ability to mentor both Campbell and Petersen might be invaluable to both players as well. Paul Gackle of the Mercury News report that the San Jose Sharks could be without forward Joonas Donskoi after he left Saturday’s game against Ottawa with an apparent head injury after taking a hit from defenseman Mark Borowiecki during the first period. While he returned not too long after the hit, he left immediately after that and didn’t play the final two periods. “He tried to come back. He couldn’t come back,” said head coach Peter DeBoer. Since the Sharks are off today, there will be no official update until Monday, but if the Sharks are without Donskoi for a significant amount of time, the team’s depth will be surely challenged. The Vegas Golden Knights chose Jonathon Merrill in the expansion draft last year and he has been used sparingly as an emergency defenseman in the past year and a half, yet Steve Carp of Sinbin.vegas writes that the play of the 26-year-old blueliner has improved dramitcally recently while the team has been without defenseman Colin Miller as he has averaged more than 17 minutes a game and he has a three-game point streak. Although Miller is expected back within the week, Carp writes that his play might get him more opportunities down the road with the team potentially resting players like Nick Holden and Deryk Engelland more often. Much like fellow Pacific Division restricted free agent Nick Ritchie and the Anaheim Ducks, promising young defenseman Shea Theodore and the Vegas Golden Knights remain far from a resolution in contract talks. TSN’s Pierre LeBrun writes that the two sides are currently not close to a deal. While he adds that the status quo can change quickly, he does not presently see an end to the impasse. This comes in conflict with GM George McPhee’s recent statement that a deal would be completed soon. With Golden Knights training camp opening up today, Theodore’s absence becomes much more apparent. The team, entering just its second season, will begin preparations for the regular season without a player that was likely slotted to begin the season on the top pair. Following the revelation of Nate Schmidt’s 20-game suspension, Theodore would presumably be the best candidate start on the left side for the first quarter of the season, ahead of the likes of Brayden McNabb, Jon Merrill, Brad Hunt, and free agent addition Nick Holden. Until he is re-signed, one of that group will be forced into the top pair. Theodore’s continued absence also hurts Vegas’ blue line depth. Although they all remain unsigned, the team did lose considerable depth in the departures of Luca Sbisa, Jason Garrison, Clayton Stoner, and Philip Holm. With Schmidt on the sidelines and Theodore still unsigned, the team is slated to begin the year with just four defenseman who played in 50+ NHL games last season and only eight with any NHL experience at all. As such, one would expect the team to do what it takes to get Theodore under contract before the puck drops on the new season. 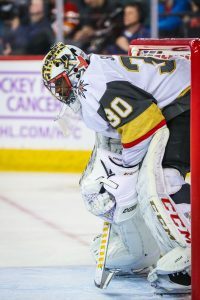 Theodore has not given the Golden Knights any reason to doubt his future effectiveness, as the 22-year-old scored 29 points in 61 games last year while skating in over 20 minutes per night. Theodore trailed only Schmidt in average time on ice and defensive scoring and led all Knights defenders in goals, assists, points, and shots in the postseason. On top of that, if Theodore’s shooting percentage regresses positively – as it should – in a full-season role, he should be even more productive moving forward. While the team can no longer treat the salary cap as a non-factor and thus don’t want to dramatically overpay their young defenseman, Vegas has too many reasons not to resolve these contract talks as soon as possible. Among the many things that went right for Vegas was the play of Tuch, who was a surprise in training camp and quickly earned himself a full-time role. 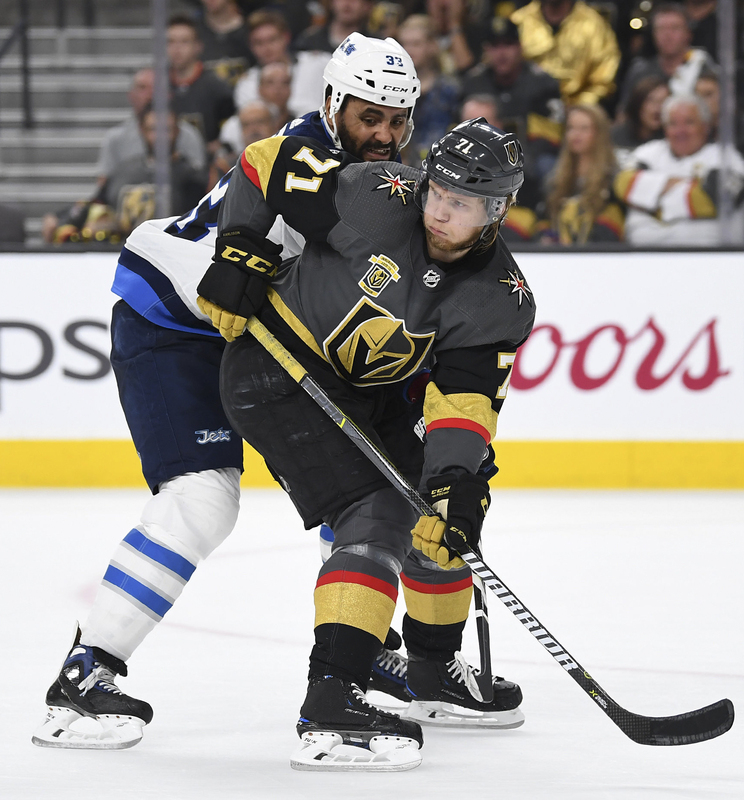 The 6-foot-4, 222-pound winger had an impressive rookie season with the Golden Knights, scoring 15 goals and 37 points with much of his playing time coming with the team’s third line. He only improved over time, showing an ability to get into the corners and extend offensive opportunities for the team. 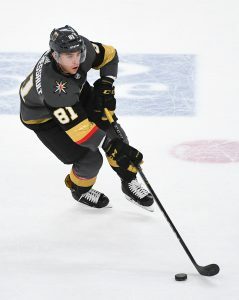 He tallied six goals in the playoffs as well, which allowed the Golden Knights to let go veterans James Neal and David Perron, knowing that the 22-year-old Tuch is ready to take his game to the next level. With one year remaining on his entry-level deal, expect him to become a key restricted free agent for the team next season. The most important piece the Vegas Golden Knights need to lock up is Karlsson, who just signed a one-year deal with Vegas Saturday. However, now the team has just one year to lock up Karlsson, the team’s top scorer, to a long-term extension. Less than a year, actually, as the team can’t agree to an extension until Jan. 1, 2019. That gives Vegas time to see how 25-year-old will respond in his second year. After piling up 43 goals last season (and seven more in the playoffs), the team wants to see that he can put up similar numbers before handing him a major deal considering the most he’s ever scored in his NHL career was nine goals. The team will also have to lock up the speedy Schmidt, as well to a long-term deal at some point. The 27-year-old was a key figure on the Golden Knights defense, posting career highs of five goals and 36 points, but also showed his mettle in the playoffs, putting up another three goals and seven points. He could easily get a similar deal to the one that Miller signed with the team (four years, $15.5MM) earlier in the offseason. With an influx of prospects likely to hitting the team for the 2019-20 season, several veterans will have to prove they deserve new contracts this coming year, including Lindberg, Bellemare, Engelland, Carpenter, Hunt and Subban, although unless someone has a breakout year, none should cost the team too much. The team likely will have to pay up if they want to keep Haula. The team’s second-line center may move to the third line now that the team locked up Stastny to a free agent deal. However, if Huala can continue to produce like he did last season, the 27-year-old should be able to fetch a nice contract. He had a career-high in goals last season as he scored 29 and 55 points. The team should also recoup some of their losses as well in two years as Clarkson’s deal will expire, so that will free up $5.25MM for the team as the team currently has to wait till the start of the season before they can place his contract on LTIR. Others like Eakin and Reaves will likely have to earn another deal over the next two seasons. Both had solid showings for Vegas this year, but will have to prove their consistency. While Reaves deal looks overpaid on paper, the team opted to give him three years worth of money as long as he only signed for two years. The team has done a nice job locking up some of their talent for the future, but have also kept a precious eye on their long-term projections. The team has a number of players in the mid-twenties who have been locked up for multiple years, including Marchessault, who has been a major key to the success of the team’s top line. They assumed the responsibilities of Tatar and Smith, both talented players, who many feel were overpaid for their services. However, both only have three years remaining, so those salaries don’t carry on for another eight years. The team has been very careful about locking up players in the 30’s, which is why they allowed Neal and Perron to walk away. They did manage to sign one of the top free agents on the market this offseason in Stastny, but have kept his deal to just a three-year term instead. In fact, the only move that seems to have broken their mold is the three-year extension they handed to the 33-year-old Fleury. Of course goaltenders can last a lot longer than position players, but the team likely made the exception seeing as he has become the face of the franchise. The team has also done a nice job locking up their defense so far. Miller, who has developed into a top-four defenseman and likely the team’s best, signed a four-year deal for under $4MM per season this offseason and he hasn’t peaked yet, while McNabb has proven to be a reliable physical presence and also signed for just $2.5MM. While the team has not made the splashy move to acquire a big name player like many assumed as they were heavily involved in the Erik Karlsson discussions, the team has quietly moved on, signing many of their free agents and keeping a keen eye on their long-term future. While the team made it to the Stanley Cup Finals in their first year, the expansion franchise has always insisted that it plans to pay hard attention to the salary cap and not abuse it. With a group of impending young talent headed towards Vegas in the next year or two, Vegas could prove to be a talented powerhouse over the next few years. With many veteran defensemen continuing to look for work, it might take a while for them to find a home for the upcoming season. With Dan Hamhuis being the top remaining unsigned defenseman on our Top 50 UFA list, not far behind him is Luca Sbisa. Sbisa is coming off an unusual season. Having been practically written off after a disappointing 2016-17 season with the Vancouver Canucks, the Vegas Golden Knights stepped in and selected the 28-year-old blueliner. While his contract might have been the biggest issue while in Vancouver (he was making $3.6MM for the previous three years), Sbisa proved that he wasn’t good enough to be a top-four defenseman when with Vancouver. However, after being acquired by Vegas, suddenly Sbisa’s game showed up as the veteran started the season as a top-four defenseman and quickly found himself averaging more than 20 minutes per game. He was paired with Nate Schmidt and was even one of the leaders of the team as he wore an “A” on his sweater. With the team expected initially to move out some of their pending unrestricted free agents at the trade deadline, Sbisa looked to be a potential major trade chip for Vegas. Unfortunately, injuries got the best of Sbisa as the veteran missed chunks of time with numerous injuries and in the end played just 30 games. By the time Sbisa came back, long after the trade deadline, the 28-year-old saw his playing time shrink as he took a third-pairing role late in the season and into the playoffs. In fact, his demotion seemed to be more of a result that other players played better after Sbisa was injured and because of that, the veteran saw a reduced role — not necessarily because he was playing poorly. Rather than bring him back on a reduced contract, the Golden Knights instead opted to sign veteran Nick Holden to take his place and supposedly never even made an offer to Sbisa. Regardless, in just those 30 games Sbisa showed some promise if he can prove he can stay healthy. Despite those limited games, Sbisa proved he can provide offense as he tallied 14 points. Shockingly, that’s his second-highest point total in his 10-year career. He did, however, have one of the worst Corsi-For percentage of his career at 43.8 percent, which didn’t help. While an offer could come at any time, many of the veteran defensemen looking for work may have to wait a while as teams assess their strength and weaknesses over the summer. Sbisa has a lot to offer and despite a 10-year career, he is just 28 and should easily be able to handle a third-pairing role with most teams. There have been some rumors that Sbisa, who spent three years in Vancouver, might be looking to return to the Canucks who are short on depth options at that position, so that is a legitimate possibility. There have also been reports that the Chicago Blackhawks might be interested in bringing Sbisa into their depleted blueline although the same rumor exists for Hamhuis. He might also be a good third-pairing option in Toronto. Before free agency, we predicted Sbisa would garner a two-year, $4.2MM contract, but with little interest so far, it would be more likely that Sbisa will have to settle for a one-year deal and be forced to show that he isn’t as injury prone as he was in 2017-18. It’s far more likely a one-year, $1MM deal or just above it is the most likely possibility. Over one hundred free agents have signed a contract with a new team already this off-season. Of that group, just three of those signings are defenseman over the age of 30: the Pittsburgh Penguins’ Jack Johnson, the Vegas Golden Knights’ Nick Holden, and the Dallas Stars’ Roman Polak. While veteran goaltenders and forwards continue to garner major interest on the open market and land substantial contracts, it seems defenders of the same age and experience are not being valued similarly across the league. With the NHL trending more toward a speed and finesse game, older blue liners who depend on positional awareness and seasoned checking ability may no longer be able to compete for jobs with younger players at the position with fresh legs and an open mind. Of PHR’s Top 50 NHL Unrestricted Free Agents, only nine remain unsigned. Two of those nine players – Rick Nash and Kris Versteeg – may not return to playing pro hockey. Of the seven remaining players, three are defenseman over the age of 30: Dan Hamhuis (#24), Toby Enstrom (#37), and Alexei Emelin (#42). Good veteran defensemen are out there and make up some of the best available players, but are simply not drawing the interest that was expected. Other unsigned names include Brooks Orpik, Johnny Oduya, Kevin Bieksa, Dennis Seidenberg, Kyle Quincey, Paul Martin, Josh Gorges, and Jason Garrison, none of whom have made considerable noise on the rumor mill. 32-year-old Taylor Chorney even moved on to Switzerland due to a stagnant market for older defensemen. Will several of these names sign an NHL contract prior to next season? Yes, however it’s unlikely that the majority will find meaningful employment if they haven’t already at this point in the summer. Of the remaining names, the most likely to land jobs are those closer to 30 without as much wear and tear on their bodies. The three players who have already found jobs – Johnson, Holden, and Polak – are all 32 or under. Emelin and Quincey at 32 have good odds, as do Enstrom and Gorges at 33. It would also be a major surprise if 35-year-old Hamhuis went unsigned. However, it would not be a shock to see only those five land a deal. This is a free agent market saturated in experienced, capable veteran defensemen, but few who can keep up with the NHL’s current pace of play. As a result, the supply greatly outweighs the demand and the free agent market for older blue liners could continue to remain quiet.